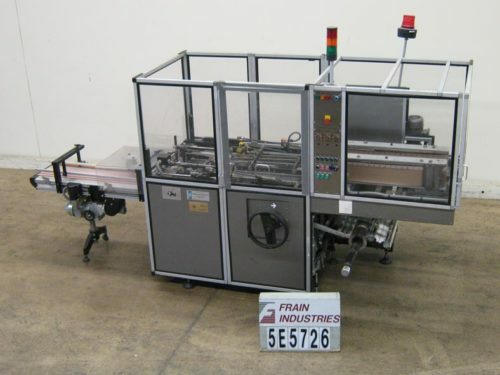 Rose FICH, Fully automatic, high speed, forming / cutting / wrapping machine for double point end fold rated from 400 to 1000 pieces per minute – depending on materials and application. Product: length 25 – 45mm, width 12- 25mm, thickness 5 -15 mm. Features three forming wheels with selector switch adjustments, heat seal station, and dual lane walking beam heated outfeed. Equipped with Allen Bradley SLC 5/01 CPU controller, Reliance Electric AC drive controller, stand alone control panel, E-stop, status indicator light, cherry / orange / strawberry / lemon indicator, auto vbr drive control, photoeyes for product presence, wrapping film reel up to 3"W by up to 14" diameter, and controls for F1 paper (start / stop) and H1 paper (start / stop). Right angle machine with painted steel frame. Last running 21mm long x 21mm wide x 10mm thick Starburst candy in a 69mm (2 3/4") wide x 90mm (3.5") long wrapper.